Space Invaders watch - ready to invade your wallet… big time! 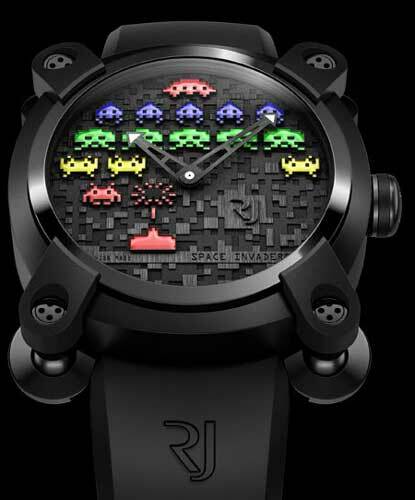 If you love high-end watches and uber successful arcade video games of the 1970s and 80s, AND have a lazy US$20,000 ready to splash around, then I present to you the Romain Jerome Space Invaders watch. All of that not enough for you? How about this then. The metal case contains fragments of the Apollo 11 space capsule. That’s right, a little virtual space on the face, and genuine space in the case. I promise I’ll stop the slide into Dr Suess right there. The insertion of material into its watch cases is Romain Jerome’s thing. Other watches made by the company contain traces of the wreck of the Titanic (the ship, not the wreck of a movie), Moon dust, and ash from the Eyjafjallajökull volcano. Swiss watches with traces of the historic and the exotic. Speaking of exotic materials, and nods to things space, the face plate of the Space Invaders watch also contains elements of moon rock. Apt really, as the makers have designed the face plate to be a representation of the moon’s surface. Before we leave the topic of design tricks, the bottom of the four ball-and-socket joints holding the face to the watch case resembles the landing feet of the Apollo lunar landing modules. The Romain Jerome Space Invaders watch is available in two colours – Day and Night. Both colours are limited edition, with only 78 of each colour to be made. Why 78? It’s a nod to the year that the Space Invaders game was released, 1978. The letdown here – apart from the rather high price – is that the face of the watch isn’t a playable version of the game. Still, that lack aside, I could quite happily own a Romain Jerome Space Invaders watch. Sorry to add to your disappointment – but the retail price for a Limited Edition Space Invaders watch in Swiss Francs is CHF15,555. So you’ll need closer to a lazy USD$20,000… or you can skip the confusing international currencies altogether, and simply get one in Sydney from Vendome Woollahra. Thanks for letting me know Charlotte, I’ll update the article. Woollahra, eh? That’s my old ‘hood.